The stakes are increasing as the penultimate European pool fixtures take place this weekend, and the Sportsground will host a key game when Sale arrive in Galway on Saturday (3pm ). Leadership in Connacht's Challenge Cup pool three is up for grabs, somewhat surprisingly after Bordeaux did a number on the in-form premiership side Sale in the last round. And with Connacht bagging a much-needed win in Perpignan, Sale's lead has been cut to three points. Both clubs have the same number of wins, but those three bonus points for Steve Diamond's side ensure Connacht need to win this round five fixture, and to give them the best chance of taking pole position, they may also need to deny the high-flying Sale a bonus point. Not an easy task, however. Sale hold the upper hand. They travel to Galway having bullied their way to victory over Saracens in last weekend's premiership fare, and Diamond's side will be confident of continuing their 100 per cent winning record against Connacht. In the October outing, Sale came out 34-13 winners, with Chris Ashton delivering a hat-trick on his return to play after completing a ban for a tip tackle in a pre-season friendly. Add in director-in-chief, scrumhalf Faf de Clerk, Aussie James O'Connor and Sam James, reliable kicker Robert Du Preez, backrow Josh Strauss, and the list of talent and experience goes on - not to mention the popular former Connacht outhalf AJ MacGinty, who ruled out for 12 weeks after shoulder injury in October, should be returning to action soon. Now flying high in the premiership after a unbeaten run of five premiership games, Sale will give Connacht difficulties no matter which team travels to Ireland, but Connacht coach Andy Friend says both sides have changed since that round two meeting. "First and foremost we will probably have a very different side out; secondly, it's at the Sportsground, and as we have seen throughout the last few matches, we have phenomenal support and it always gives the boys a lift; and the most important thing is that we are a different football side now," says Friend. "I keep saying we are growing and developing with each game. The Munster game at the weekend was a really good for us in terms of exposing areas we need to fix and work on, and out of that loss, we will become a better side. It's a very different game and two very different teams, but a home venue for us." Connacht are boosted by the availability of Ireland centre Bundee Aki and captain Jarrad Butler, both having missed last weekend's 31-24 defeat to Munster, while Denis Buckley, a late withdrawal against Munster, can expect to finally make his 150th game if cleared to play. While Cian Kelleher has decided to depart the Sportsground (with an expected to return to Leinster ), Jack Carty this week signed a two year contract extension, and he is expected to continue in the pivotal outhalf position. Ireland lock, and fluent French speaker (referee is Frenchman Pierre Brouset ), Ultan Dillane, who is also remaining at the Sportsground for two years, may be expected to feature. With a lot riding on Saturday's showdown, Friend is confident Connacht will "put on a good show". "I am saying we are a better football team, I would suggest they are as well, it's just who has made the bigger step forward," he says." I still go back to that game in Sale and at half-time it was even-stevens, and in fact we leaked a try just before half time. Second half things didn't go our way, and they got three scores ahead of us, but still, with the team we took down there, and giving blokes opportunities, there was lot of good things to come out of that performance, so we welcome Sale this weekend. "We have been working really well with the strength and conditioning, and medical staff, and trying to give blokes opportunities, and there may be a few, who people did not expect to see, on the team sheet, but there will be a nice balance. "It does have a knock-out feel, we are both in position with three from four, and this is the do-or-die battle, No 1 versus No 2, and the game will live up to that expectation. "Sale have upped their game in the Premiership - any team that knocks of Saracens is a good rugby side - and they have threats across the park. But I know we will put on a good show. "We want to be in the play-off stages and a win would nearly get us there." Such a huge clash coming on the back of three energy-sapping interpros will test Friend's squad system. Certainly, Connacht were a little short last week against Munster, yet produced a performance that could have yielded more than a losing bonus point, 24-31. In front of a sell-out crowd, the final festive fixture was a thriller, but Munster's victory ensured they took the No 1 spot in the PRO14's Conference A. It was a deserved win for Johann van Graan’s side, who came fully loaded. And they made it count, superb in the front five, dominant in the maul, and a tad more wily. Connacht were not helped by late changes, including the loss of Denis Buckley, while also without Bundee Aki, Kieran Marmion, Tiernan O'Halloran, and captain Jarrad Butler. Yet in Tom Farrell, Connacht had the game's most exciting back, who set the Sportsground alight with his ability to break through Munster's defence and produce deft passes in contact. Combining with Matt Healy, he also stripped No 8 Arno Botha to bolt from the 10m line to score the opening try, which Carty converted. Munster did not take long in replying, however, with a clever kick from left wing Alex Wootton putting them in position. And when the ball was sent wide, Keith Earls provided captain Peter O'Mahony for the try, Joey Carbery converting. From a five metre scrum, Munster grabbed the second, scrumhalf Alby Mathewson sending Dan Goggin crashing through. Again Carberry added the extras for a 14-7 lead. The home side narrowed the gap with a Carty penalty before the break, and they maintained that momentum after the break when new centre partnership Tom Daly and Farrell combined to send Kelleher away, giving Friend's men a 17-14 lead after Carty's conversion. 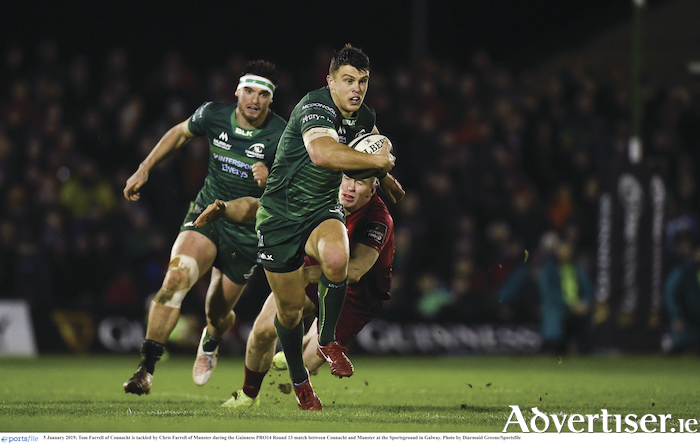 It sent a signal to Munster who grabbed control, brought on their heavy hitters, and with backs and forwards always making yards, Connacht's defence was stretched. Tadgh Beirne gave Munster the position five metres out before Mathewson's long pass found an unmarked Goggin who bagged his second, despite calls of a forward pass. Carberry was on song again, adding the extras, a penalty, and before long the decisive fourth try to ensure Munster would take the spoils. Not to be outdone, however, Carty followed suit following a break by the influential Colby Fainga'a to score and convert a try. Friend praised his squad's ability to give 100 per cent. "They didn't leave anything in the tank, which is something we have come to expect from his team, they give everything they have got. We played a good footy side, [it was] a good game of rugby, unfortunately there is a winner and a loser, and we ended up on the wrong side. "It was a good arm wrestle. We said at half time it was going to be the team that loses concentration first and doesn't stick to sytems that will lose it, and in fairness it was us. To get back to seven and keep challenging for the draw shows the ambition of the team." It ensured Connacht bagged a bonus point, and came away from the Christmas interprovincials with a win, and three bonus points. "On reflection we put ourselves in position [to win the three interpros], so there is an element that we probably did leave a few points out there," said Friend. "We look at the table and it's nice and tight, and those points are going to make a difference, but we won't dwell on those things, just make sure next time we are better and we get that additional try."